Mehdi Hasan: A lot of people aren’t aware of the kind of crazy racist, Islamophobic abuse that you and Rashida Tlaib of Michigan have received since arriving here in Congress, incited some might argue, by some Congressional Republicans, by the president of the United States. What does that been like for you, the incessant hostility, abuse, your staff getting calls death threats? Ilhan Omar: I think you know if you look at it within the context of what we are trying to do, it sort of feels like it comes with the territory. I mean, we’re shifting I think the idea of who should have a seat at the table. These systems really weren’t built for people like Rashida and myself. And I think we can spend a lot of time focusing on the doors that we have to open and keep open or let this deter us. And I think that’s what they would like us to do. They would like us to be afraid. They would like us to shrink but Rashida and I are quite used to bullies and we’ve always beaten bullies. And I think the people in our districts, I know the people in our districts who voted for us knew that we were the right people to come here and shake things up. Mehdi Hasan: And what you so clearly lay out on that op-ed ("Now Is the Time to Begin Impeachment Proceedings Against President Trump," Detroit Free Press January 2019) is you don’t need to wait for Robert Mueller. There’s enough stuff in the public domain. He does impeachable stuff on a weekly basis. So just for our listeners, briefly make the case for why you, what is the main case that you think is for impeachment? Putting Russia-gate to one side. Rashida Tlaib: Absolutely. The Constitution demands it and I want to reiterate to people to understand that this is beyond the collusion with Russia. This is beyond the Mueller investigation. Every single day that he’s President of United States that has not divested in all of his domestic and foreign corporations, he’s making decisions not in the best interest of the American people. He’s making it based on the profit lines. There is a slippery slope here. If we allow the president United States not to release his taxes and not to understand where his corporate interests are, then who’s next after him? It causes a tremendous amount of fear, I think, for my residents back home and for myself and others that understand we now have a guy that still is sitting, in many ways, CEO of various interests foreign and domestic. And he’s making decisions, looking the other way, even on Saudi Arabia, looking the other way because of his investments. Chris Hayes speaks with Abdul El-Sayed, the former Health Direc​tor of Detroit, about the benefits of single payer healthcare. ABDUL EL-SAYED: So part of the problem with health care in the United States is that everybody's incentivized to make a buck out of it, whether you're a provider, doctors, hospitals, or you're a payer. That's the insurance industry. And right now, the way it works is that we have a ton of unnecessary care, because that's how doctors, providers make money. And we have a lot of money just spent on the provider side because we have duplicated overhead across all of these insurance companies, and because they all make 15 cents on the dollar for every dollar spent in health care. Both of those things are deep inefficiencies, and that has to have a structural fix. What “Medicare for All" does is it basically squeezes out the payer side of profits. It says, look all of these insurers that we have, which by the way, nobody likes. I mean, nobody is like, "I love my insurer." AFTER DECISIVELY BEATING five other candidates in last month’s primary race to represent Minnesota’s 5th Congressional District, Ilhan Omar is on her way to becoming the first African refugee and Muslim woman to serve in Congress. She joins Alexandria Ocasio-Cortez and Rashida Tlaib in a wave of progressive women taking the Democratic Party establishment by storm. Before coming to the U.S., Omar spent four years in a Kenyan refugee camp, having fled the civil war in Somalia. She immigrated to America at the age of 12. 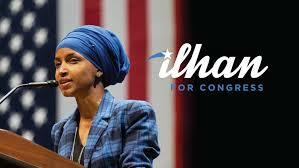 Please click here to learn about Omar's campaign. Please click below for Omar's interview with Mehdi Hasan. ​California Community Colleges are where students can achieve their dreams regardless of any educational, social, or economic challenge. They provide academically robust, diverse, inclusive, and innovative learning environments that engage students of every background to develop their intellect, character, and abilities; to explore, define, and achieve their goals; and to be socially responsible community members and leaders. Alexandria Ocasio-Cortez for Congress NY-14! ​Educator and organizer Alexandria Ocasio-Cortez is challenging one of the most powerful Democrats in the country for his congressional seat. She is running on a platform of social and economic justice. Ocasio-Cortez explains why she wants to unseat the “King of Queens,” Rep. Joseph Crowley. Check out Ocasio-Cortez's inspirational vision and interview below. The California Community College system is the largest engine fueling the economy of California while educating and improving the lives of millions of people every year. Please check out this study that argues that legislators and policy makers have a unique opportunity to keep California at the forefront of a transformational experience for students who are most underprepared and economically disadvantaged. A guiding principle for this paper is that while California’s various governmental budgetary systems are categorical and operate within a system of allotments and constraints, there is a larger general economy that should be taken into consideration. Where would a relatively modest infusion of funds provide the greatest return for the advancement of both California’s general economy and for its residents? The non-ambiguous answer is a community college system with a substantive core of full-time tenured faculty and part-time faculty who are appropriately compensated for their participation in the life of the institution through the provision of job security, equitable salary, and respect for their services. A new exposé by Reuters reveals how the Trump administration plans to make the U.S. an even larger weapons exporter by loosening restrictions on the sale of equipment ranging from fighter jets and drones to warships and artillery. Reuters reveals that the new initiative will provide guidelines that could allow more countries to be granted faster deal approvals, and will call on Cabinet officials to help close deals between foreign governments and U.S. defense contractors. Steven Ash holds drawing of Stephon Clark at his funeral. Photo by Associated Press. 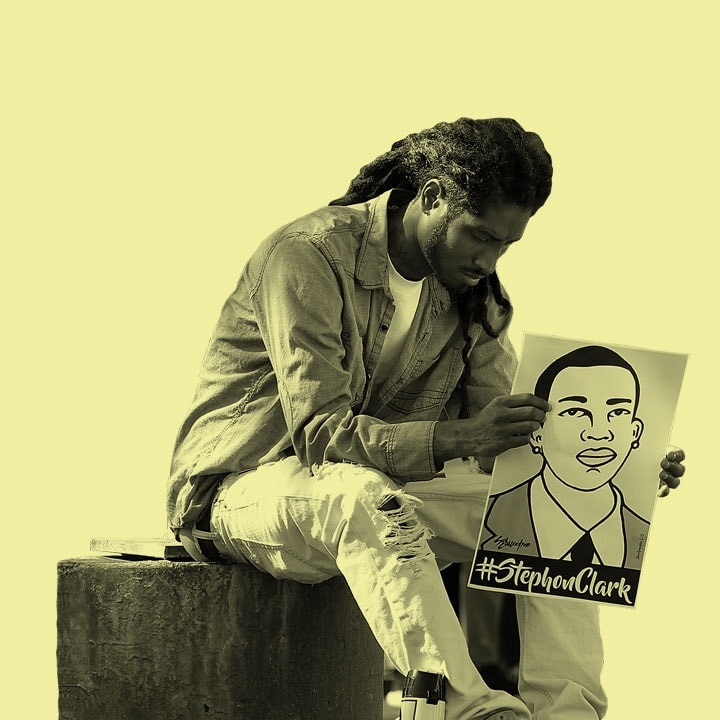 ON THE EVENING of March 18, Stephon Clark, a 22-year-old African-American man, was returning to his home in Sacramento, California, when the police mistook him for a vandalism suspect — and his cell phone for a gun. They fired 20 rounds, eight of which hit and killed him. On episode 3 of “Deconstructed,” Clark’s fiancée speaks out on Clark’s death. In her first national interview, she calls on President Trump to take action on police violence. And she responds to White House Press Secretary Sanders, who last week called Clark’s death a “local matter.” “It’s not a local matter,” Manni tells Hasan. “This is happening all over America. So it’s bigger than that.” And Professor Ibram X. Kendi of American University joins Mehdi to discuss how America’s history of racist ideas creates the law enforcement environment we see today.